in just four simple steps. 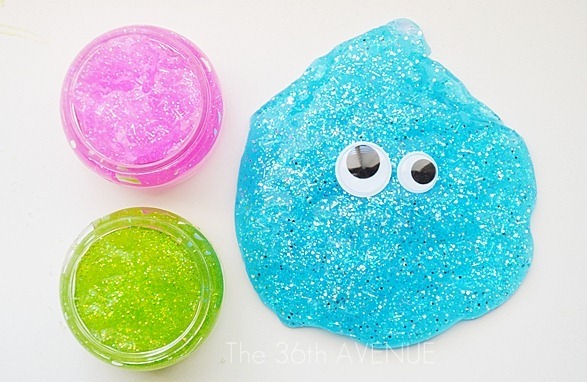 Well, not just slime but awesome Glittered Slime! Your kids are going to love you!!!! Mix 1 tsp. Borax and 1 Cup water together. 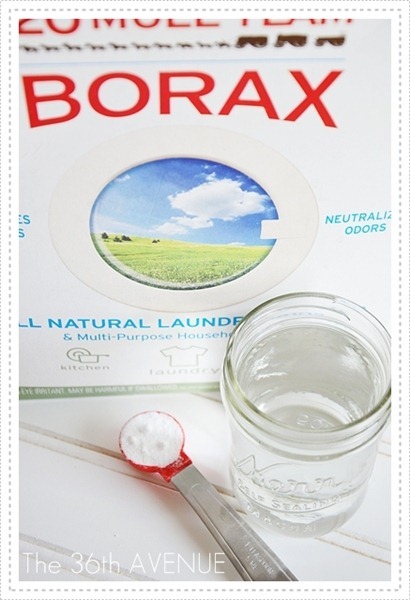 You can find the Borax at your local stores in the Laundry section. Call me crazy but I love the box. 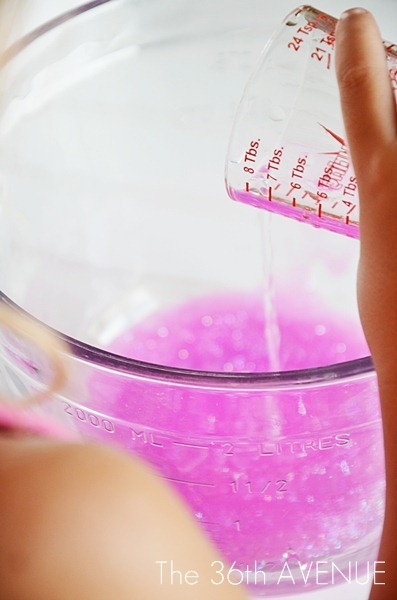 Have your little helper empty the Glitter Glue into a bowl. Add 1 TB. 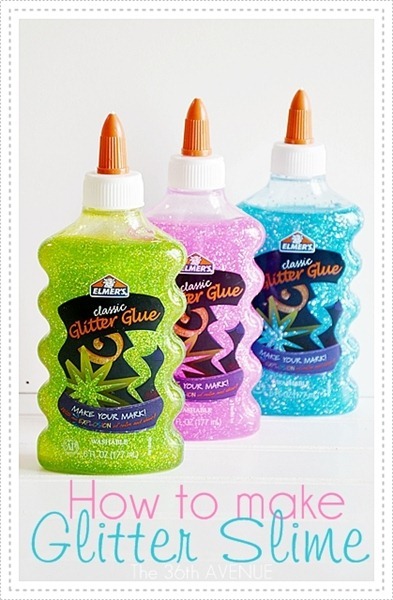 Water to the glue and mix it together. This will help the glue to become a little more flexible. Then pour the Borax mixture inside of the bowl. 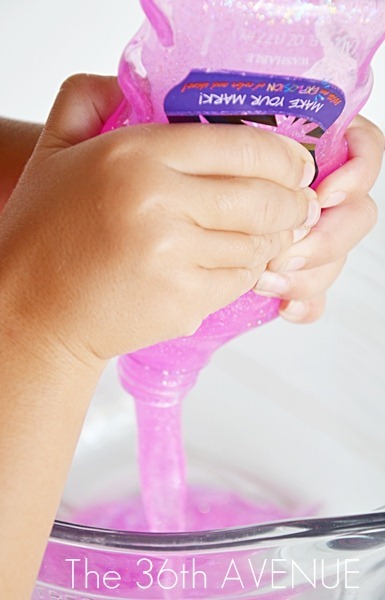 Let their little hands work the magic as they combine the glue and the mixture together. 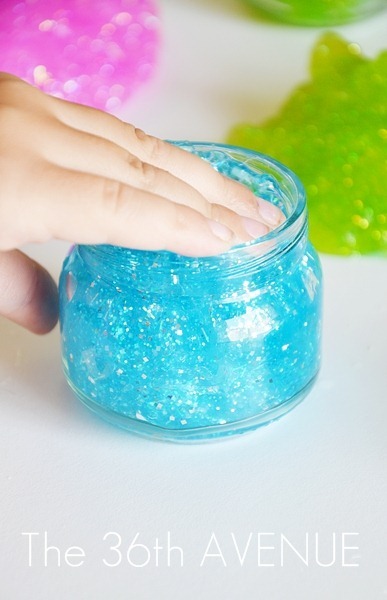 Right away you will see how the Glitter Slime will start to form. I love this part when you hear them say oooh and cool at the same time! 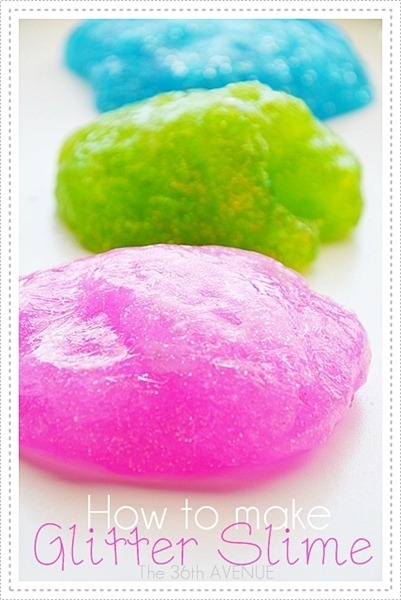 Don’t leave the slime in the water mixture too long since it will make the slime too hard. Finish mixing it in your hands. TIP: Don’t throw the extra Borax mixture yet. 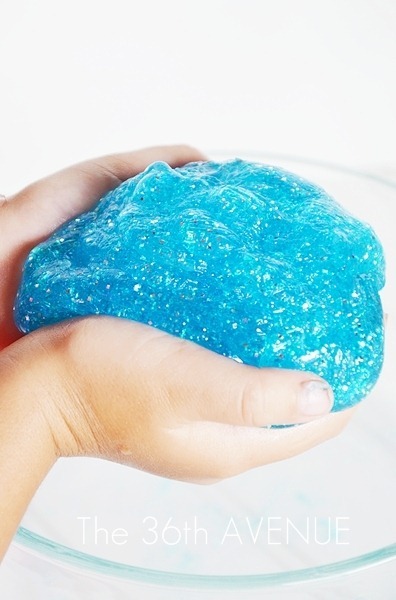 If the slime gets too slimy you can put it back inside and it will harden some more. 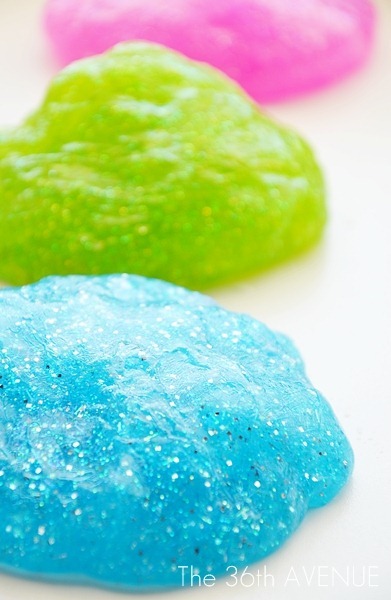 We made the Glitter Slime in three colors. To store it we used baby food jars. 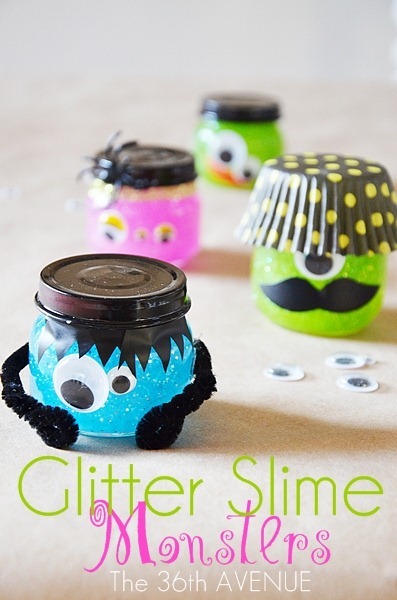 What about if we make some Halloween Glitter Slime Monsters with it. They should be scary but I am going to say that they are super cute! WOW! That’s great… Thank you for sharing! I used clear glue, 2-3 drops of food coloring and fine white glitter. Since she’s 2, we left it in he borax a little bit longer. we were still able to tear it and stretch it. We were able to tear small pieces, form them into balls and they bounced everywhere….on the carpet, on the tile, on the plastic table….she loved throwing it and chasing after it. 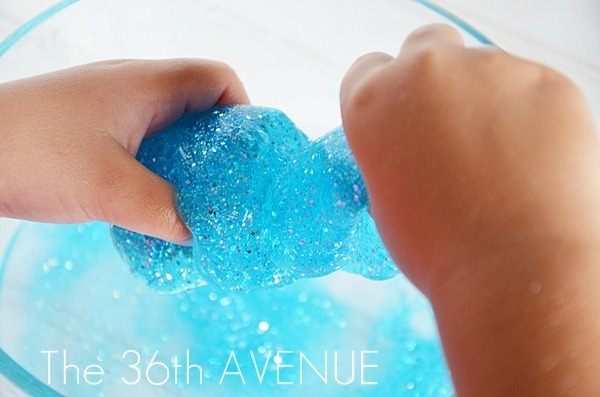 I love making this with my kids!!! I made some around Halloween last year for my eldest boy’s boy scout troop but I added glow in the dark paint. It didn’t stain anything and the kids LOVED it. I added about 1 1/4 tbsp to my mixture. You can also use liquid starch.